PLEASE NOTE! Though the Kikyuunes have personality traits given to them by both me (Myst) and the UTAU fanbase, they are entirely optional and songs or art made with them do not need to follow these guidelines. This goes for any pairings/ships as well. 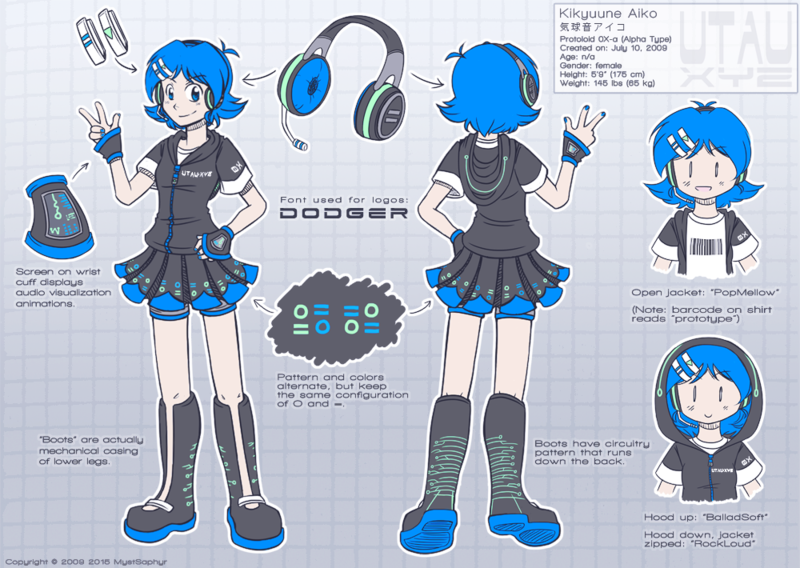 Meaning: "sound of the soul/balloon sound" "beloved child"
Aiko is tomboyish, and awkwardly lanky and tall. She's easily distracted and spends most of her time daydreaming or playing video games, and her temper is as short as her attention span. Aiko has a love of high places, and enjoys traveling in flying vehicles or looking out from observation decks on towers or tall buildings. She can be loud, proud and belligerent; she hates being seen as vulnerable to others. She sometimes slips into a Tennessean accent, moreso when she loses focus or becomes particularly aggravated. Meaning: "sound of the soul/balloon sound" "bright man"
Akio is Aiko's older (by design) brother. He is a timid, though very clever, young man who loves nothing more than to learn how things work. He is a tinkerer and can is quite good at repairing anything from a steam engine to a laptop computer; the only problem being he rarely repairs anything. Instead, Akio gets curious and takes the object apart entirely, usually putting it back together with strange or disastrous results. Crack: Fears women. Unofficially paired with Manida. He also happens to be dead, after being murdered by one of Aiko's fanmades. But whenever he attempts to tell anyone in the family that he's a ghost, he gets interrupted somehow. Meaning: "sound of the soul/balloon sound" "bright child"
Akiko is extremely interested in the paranormal and unknown, and enjoys writing both fiction and nonfiction on such subjects. However, this has made her into a bit of a paranoid conspiracy nut, and she often insists that she and other UTAUs were created using alien technology. The antennae on her headset is very sensitive to various radio frequencies. Meaning: "sound of the soul/balloon sound" "bright prince"
Akihiko is an android, and a failed stuntman (his costume is loosely based on the motorcyclist Evel Knievel, as well as Saiyaman from DBZ). As he is constantly destroying himself by messing up dangerous airplane stunts, he has been rebuilt at total of 142 times by his mechanic son, Akio. He has an overdramatic flair and often acts as his own announcer before his performances. Fuusenne doesn't like getting stuck in trees. If you see them stuck in a tree, please get them down. Carefully. Occasionally paints a sloppy version of Aiko's face on their own and mocks Aiko by repeating everything she says.